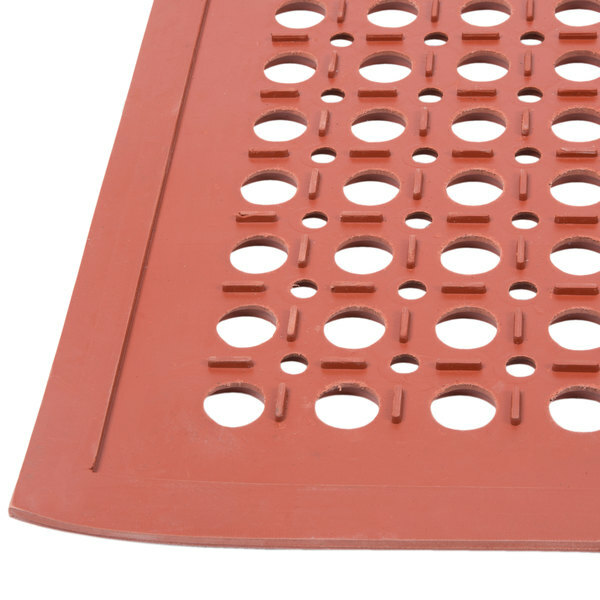 This Teknor Apex 755-101 T30 Competitor 3' x 5' red, heavy-duty anti-fatigue floor mat is made of durable rubber with grease-resistant properties for superior traction in wet or greasy areas. 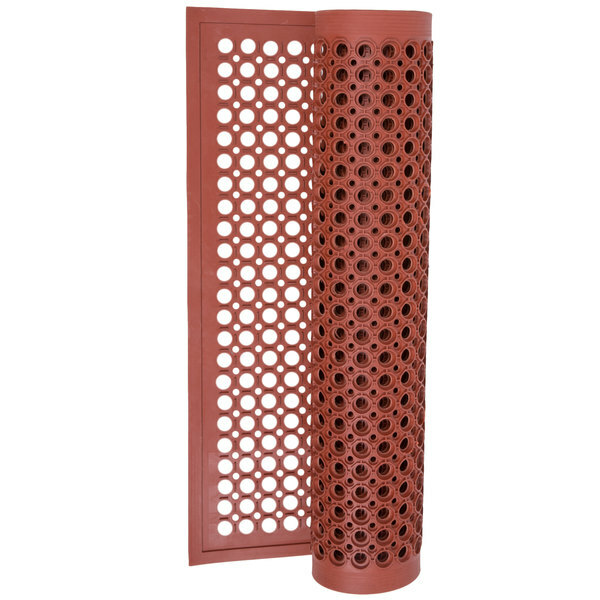 The drainage system works to remove liquid and debris from the platform, giving you sure footing in the slickest areas, and the low-profile design reduces trip hazards. 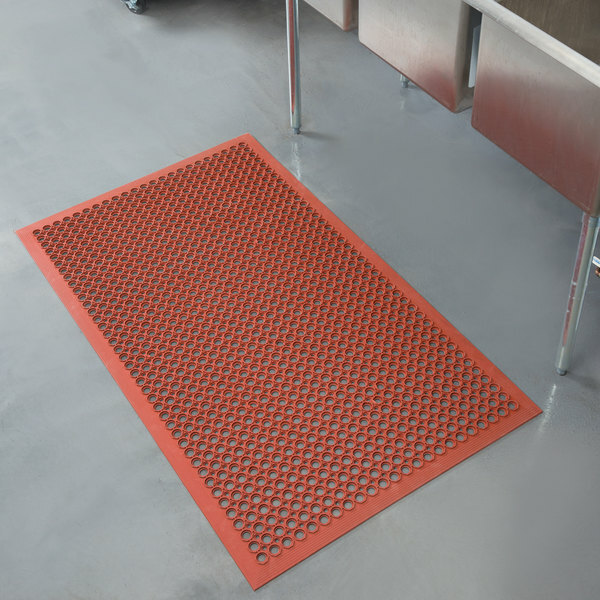 This versatile mat is ideal for use in front of fryers, ranges, dishwashers, and other areas where grease or water is often spilled. Additionally, this mat is capable of relieving foot pressure while also reducing stress on the lower back, leg joints, and major muscle groups for all-around body assistance. 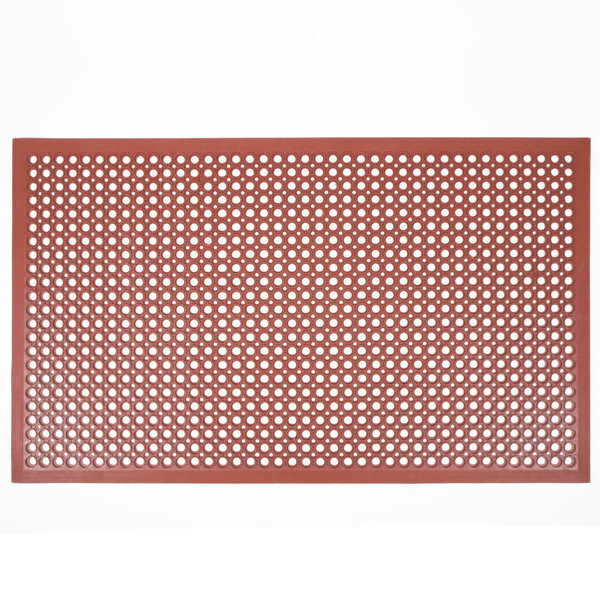 As an added bonus, this anti-fatigue mat also helps protect your floors from scuff marks and scratches, as well as providing a softer surface that can absorb the shock of falling items, effectively reducing the chances of breakage. Each feature serves to equip your foodservice operation with anti-slip properties that help create a more comfortable and safer work environment. Great product that is high quality and sturdy. The product has help up great so far and very beneficial in a busy kitchen in front of our fryer. Easy to clean and move when cleaning floors. Would recommend! It's a feels and acts like a heavier mat, It stays in place and doesn't bunch up when the floor is very wet. The thick design should prevent the creases from being folded. If you want the best price for these mats buy them at webstaurant!! These are very easy to roll up and send through the dish tank to be cleaned. 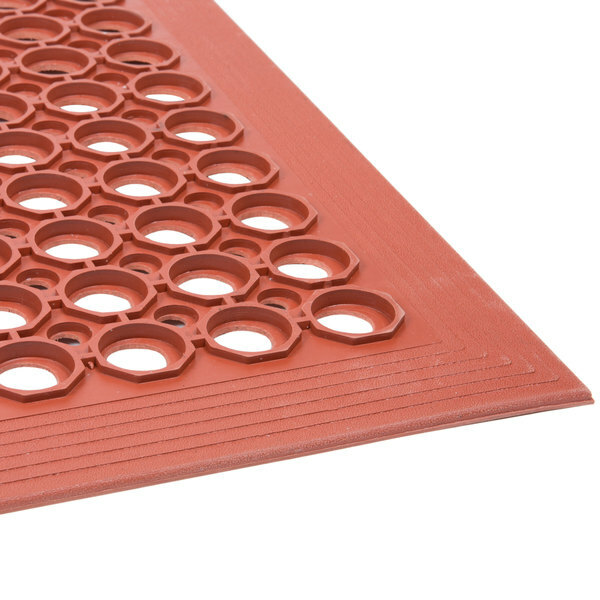 They are definetly great for slip proofing where water or grease on the floor is present!! good for the price, wouldn't recommend for use behind the line. we are high volume with a fryer and they hold grease and are hard to clean. We appreciate your review, Jeremy! If you are looking for a different product that will better suit your needs, please contact our Customer Solutions team. We appreciate your review, Nicole! If you are having any issues with the product you have purchased, please contact our Customer Solutions team. These are great non-slip mats! affordable and good quality! my guy with a bad back like them a lot. only con - they DO get dirty and fast. cleaned nightly, but retain a dirty look even when scrubbed clean, AND power-washed. These are great for use behind a bar or in a light duty kitchen. 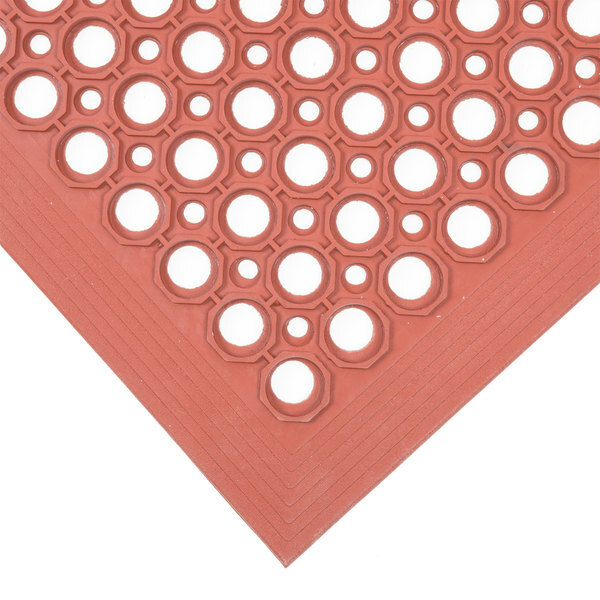 We use these red colors for our bar mats. One note on the color -- they get dirty and fast. They are cleaned often, but retain a hazy-dirty look even when scrubbed clean. The black ones hide track marks much better. They are easy on the knees! I bought this to cut down on falls and it has not failed yet. Also this product seems to be holding up rather well I've only had it for about 3 months. All in all I would buy this again. as with most kitchens we have a tile floor. and when they get wet they get slippery. with these rubber floor mats wet floors are no longer an issue. they are priced to sell and easy to clean. These are great non slip mats! They are much more affordable but are of the same quality! They are easy to clean at the end of the night!!! 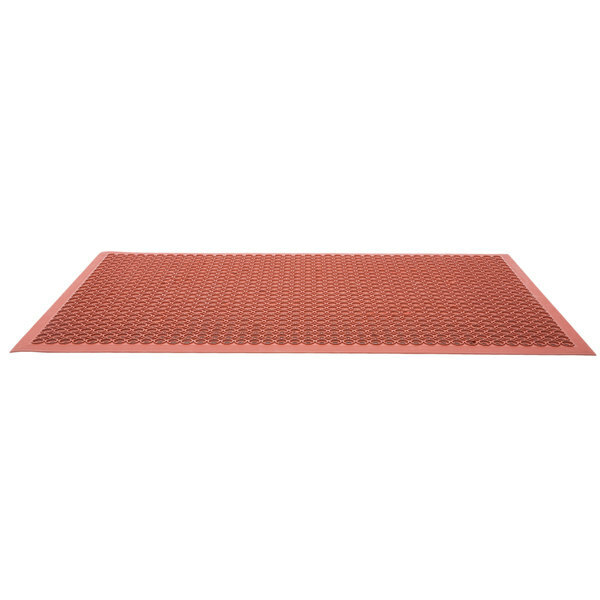 The Teknor Red Grease Resistant Rubber Floor Mat 1/2" Thick Bevel Edge. Is great by the dishwasher.When the tile floors get wet they are very slippery.They also help with comfort from standing on hard floors to long. Easy to clean with soap and water. These mats are good for medium traffic areas. They are great for spot that some one will be standing in the same spot all day like the dish pit. These mats are perfect for greasy floors. They have not fallen apart after 6 months of heavy use. They clean really easily with soap and water. Not a bad mat for medium to light duty use, didn't hold up to our high traffic heavy duty use as I thought it would but not bad for the price. Really heavy duty. I used it to cover a spot on my floor that was slightly irregular, and the mat just levels the floor right out. It's easy to clean and looks great.